break so I thought I’d check it out.. Now I’m hooked! I’ve been playing MapleStory since summer of 7-8th grade so I was around 12 years old when I started. Then there was leading a guild in Broa name TrueMagic and making life time friends from it. I quit MapleStory back in 2010 after the BigBang patch game out. Being banned by Nexon for 3 months was pretty much the last of me logging on actively onto MS until recently. I found out later I was banned for naming a character ButtFaceKoC in a server I didn’t even played in. Thanks Nexon, you da best. What attracted me the most about the Reboot server is Nexon advertising it as “bringing the old times back”, which is some what true. The different thing about the server is that it is not as pay to win anymore. Items such as Teleport Rocks, Miracle Cubes, and Safety Charms are all purchasable by mesos. I really like that idea because I was never really the type of person who would want to spend thousands just to be strong in the game. When I started playing I was not disappointed. As I logged on to try out the reboot server, it bought back a lot of memories of interacting with them online strangers. I would party up with people with the same objective, have small talk, some people stuck as friends, some remain by passers. I originally made a adventurer warrior when I tried the server out alone, I didn’t really get far with that character. I invited Arthur to try reboot with me and he decided to making one of the Sengoku class Hayato. I wanted to match him so I picked Kanna without knowing what I was getting myself into. I really had no idea what I wanted to name my Kanna. I’m a little obsessed with my hamsters so I picked HamsterHat. Why HamsterHat? I don’t know… guess I just wanted something the flows well with the word hamster, haha. Picking Kanna turned out really well. The class was unique to my perspective. They didn’t really feel like a copy of other classes (which I really hated about a lot of the recent classes.) I later on found out about the fact that everyone wants me in their party for my Kishin skill. 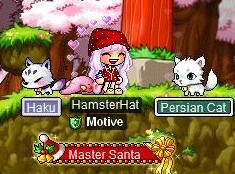 Not to mention Kannas are a boss at farming mesos so I’m probably going to stick with HamsterHat for as long as I play reboot. I was never really an event person on MapleStory but for some reason I became really obsessed with finishing this year’s Christmas event. It was a long confusing journey, many Maplers gave up in the end but I made to the end! I was very happy. The rewards include the Master Santa medal and the Chair. It is kinda nice to have something to show off for finishing the event quest line. Haha. I got into the event mostly for the medal but the story really got to me. It was actually a cute story. The story started out with Santa injuring himself by crashing his sled so now you are stuck playing the role of Santa to win the Master Santa contest (or whatever it was called). 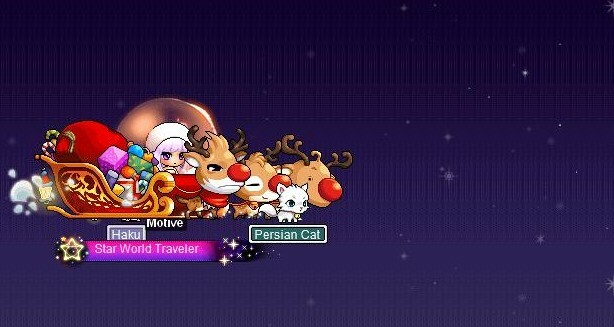 During the quest line you are to recruit elves and reindeer to join the Santa team. All of the members you approach ask for a favor before agreeing to join. I have always been a guild person on MapleStory. I was kinda happy when Arthur decided that he wanted to make a guild and got serious with recruiting. The guild originally consist of a lot of Arthur’s old friends from Bera. Then Ryan, my first Reboot friend, joined and a lot of other reboot friends join as well. I was surprise on how much guild pride a lot of our members had. It made me really happy to have a family on the reboot server. I remember playing on Bera and joining a guild I never felt like I belonged to. I would always get mad at guild leaders that did not know how to be guild leaders. Guild leaders that did not bother creating a guild culture, or did not even try to get to know the guild members or try to keep the guild together. I guess most people start guilds because they wanted to put all their friends in the same guild but to me, I’d like to be in a guild that actually cares about the fact that we’re in a guild, its like being a family and looking after each other! We grew a lot as a guild and currently we’re standing at rank 32 (02/05/2016). Plan on climbing that guild ladder higher! I slowed down a little on playing MapleStory. I mostly go on there just to do dailies but I still enjoy chatting with guild mates and from time to time doing random boss runs and leveling. I’m level 211 now so, it’s a little demotivating to level unless there is a 2x event.